If you've ever been to Japan, you know one thing: mayonnaise is very, very popular. Japanese people like putting mayo on all sorts of food. So, it shouldn't be surprising that there is actually a mayonnaise museum in Tokyo. The main area is called "Salad Hall." 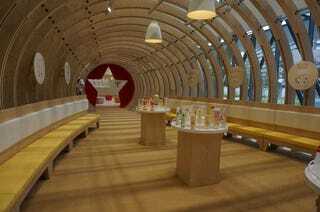 This is the "Mayonnaise Dome," and it's a wooden replica of a 450g Kewpie squeeze bottle. MayoTerrace allows visitors to learn about the history of mayonnaise as well as see how it's made in the factory. There's also a "Kewpie Kitchen" in which visitors can make their own original mayo-based sauces and dressings. Kewpie even gives visitors free samples to take home. However, be aware that, according to website Yasutaro Blog, there is a two-month wait to get the necessary reservations required to enter MayoTerrace.